According to the report, PE/VC investments in the TMT sector remained dynamic in the country in the latter half of last year, representing more than half of the whole industry investments by value, with the highest single deal worth US$4 billion. The total value of investments that had a single deal value over US$ 100 million accounted for nearly half of the TMT total investments during the reporting period, while a large number of investment deals were below US$ 100 million in terms of single deal value. Gao Jianbin, PwC China’s technology industry leader, says that there is a lag in the investment decline for the TMT industry compared with overall industry, but the industry is still attracting far more investments than other industries. The polarization in investments reflects a fact that the high valuations of unicorns have deterred new investments. Internet was the best performer in the TMT sector, in terms of deal value and volume. The sub-sector saw total investment value hit US$18.19 billion in H2 2016. Some new business patterns such as O2O bike-rentals and live streaming have attracted huge investments. In addition, investment in entertainment and media subsector was on the rise, with the number of deals reaching a record high of 108. IPOs have become a major form of exit for investors. 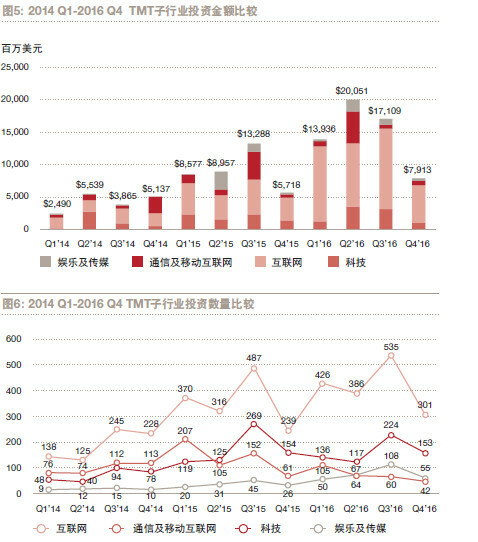 A total of 58 Chinese TMT firms have raised RMB 33 billion in the second half of last year. During the reporting period, the two largest tech IPOs in the country belonged to Meitu and China Film Corp. Photo editing and sharing app developer Meitu raised roughly RMB 4.2 billion through its Hong Kong IPO last December, recording the largest technology listing in Hong Kong in a decade. China Film Corp listed in the country’s A-share market, raising RMB 4.17 billion.